The government’s promotional website www.korea.net has been revamped with an improved design user interface and expanded content, officials said Thursday. The Ministry of Culture, Sports and Tourism and Korean Culture and Information Service had analyzed how the platform was used and made changes for the new version. For example, the sizes of the text and photos have been made larger, and the menu was reorganized to help users find information more easily. A poll function was added for user feedback. 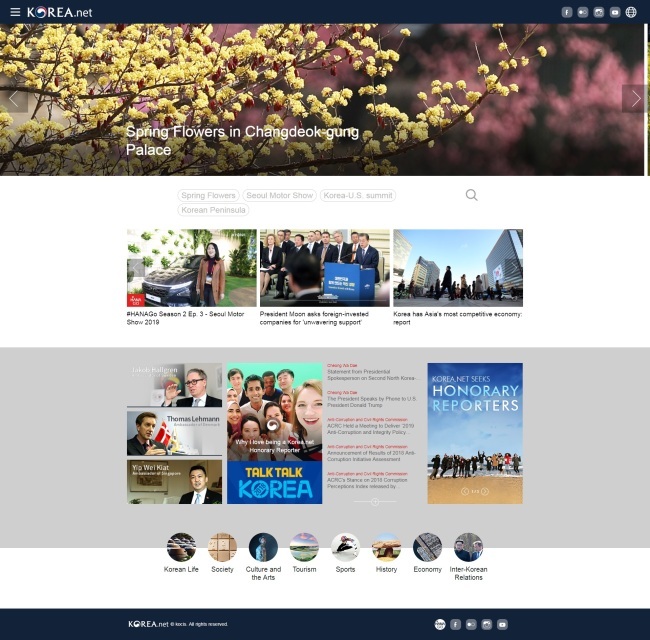 The Opinion section, which carries expert opinions on issues like peace on the Korean Peninsula and inter-Korean relations, has been expanded, as well as Korea-related articles sent by 539 honorary reporters from 73 countries. Officials said they plan to make Korea.net the go-to website for policy-related news in Korea. They plan to implement a system in which policy news are automatically sent and updated as soon as they are uploaded to the homepages of respective government branches. To enrich content, a Hallyu YouTube channel broadcast in different languages is also on the way. Korea.net, created in 1995 as Korea Window, has been the government’s main promotional website aimed at foreigners, covering a wide range of topics including policy, diplomacy, foreign relations, culture, sports and tourism. It is currently available in nine languages: English, simplified Chinese, Japanese, Spanish, German, French, Russian, Arabic and Vietnamese. Last year, 22.8 million people visited the website.